Led by large crowds, funeral prayers were held yesterday for the two martyrs - Ahmed Mohammed Ahmed Zeyoudi and First Lieutenant Pilot Abdullah Mohammed Yamahi - martyred in service during ‘Operation Restoring Hope’ with the Arab coalition led by Saudi Arabia in Yemen. The funeral prayers were held in Fujairah. Earlier, yhe bodies of two Emirati martyrs, Ahmed Mohammed Ahmed Al Zeyoudi and Abdullah Mohammed Saeed Al Yamahi, have arrived at Abu Dhabi Executive Airport, Al Bateen. Senior armed forces officers welcomed the martyrs' bodies, which were brought home by a military aircraft to a special military reception. The General Command of the UAE Armed Forces yesterday mourned the death of the two martyrs who fell while carrying out their national duty as part of the Saudi-led Arab coalition’s Operation Restoring Hope in Yemen. The General Command of the Armed Forces on Monday announced that its military helicopter crashed, killing a pilot and co-pilot. Both of them were among the UAE forces taking part in the Arab coalition's ‘Operation Restoring Hope’, led by Saudi Arabia to back the legitimacy in Yemen. In a statement, the General Command of the Armed Forces extended its sincere condolences and sympathy to the families of the pilots. May Almighty Allah rest their souls in eternal peace. The father of Lieutenant Pilot Abdulla Mohamed Dhawi Al Yamahi expressed his pride of the martyrdom of his son, reported Emarat Al Youm. He stressed that his son will be in heaven, his Eid will be in paradise, and martyrs are in a place better than we are. He added that martyr is decorating his family and he is the pride of his brothers. The father said that his son was a 25-year-old, married nine months ago. He added that his wife is awaiting her first child and this child will be proud of his father – that he will be the son of a martyr who sacrificed his life for his homeland. He added that the Martyr had eight brothers and sisters and has one son is in the armed forces and all of them are ready to sacrifice of their lives for our homeland. Khalid Al Zayodi the brother of the martyr Ahmed Mohamed Al Zayodi said that the children of the martyr is our responsibility now and in our custody. He stressed that his brother asked in his will to raise them to be patriotic. He pointed out that the last call of the martyr was yesterday morning as he talked to his wife and asked about his six-year-old twins (son and daughter). He added that the martyr's wife is seven months pregnant and waiting for their baby. He said that the martyr has eight brothers and sisters and they are proud of him, particularly after the martyrdom for the homeland. 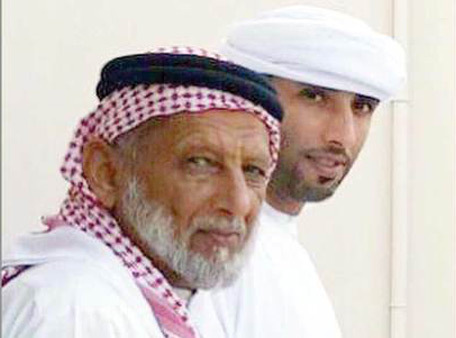 The families of First Lieutenant Pilot Ali Mohammed bin Tarish Al Ka’abi, and Lieutenant Pilot Mohammed Nasser Al Dhaheri, martyred after their military helicopter crashed, have expressed pride at the martyrdom of their sons. They emphasised that all members of their families are ready to sacrifice for the nation, according to Emarat Al Youm. UAE General Command announced the day before yesterday, Sunday, that a military helicopter crashed during a routine flight in international waters that lead to the martyrdom of the pilots. Ahmed Tarish Al Ka’abi, the nephew of the martyr said that his uncle was aged 33 and has three children aged between three and seven. He said that the mother of the martyr received the news of the martyrdom of her son with strong faith. Butti Al Dhaheri the elder brother of martyr Mohammed Al Dhaheri from Al Ain said that the martyr was 22-years old, unmarried. He added that the martyr has four brothers and three sisters, all of them ready to sacrifice for the homeland. He said that we were in contact with the martyr few hours before the crash via WhatsApp.